Before sending your formal wedding announcements, you’ll want to know the basics of “when” and “where.” This means that you will need to have your wedding site and reception site scheduled first. If planning a religious ceremony, schedule with your clergy, and talk with him or her about what wedding sites and practices are acceptable to you both. 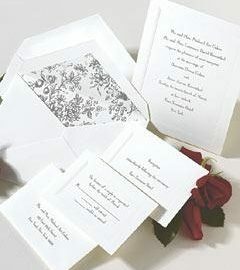 Visit several reception centers and decide which fits best in your wedding theme and your wedding budget. Many excellent sites are listed in our “Event Locations” section. Once you have scheduled a wedding date and site, you are ready to announce your wedding! If you choose to place an announcement in a newspaper, you can call them for suggestions on announcement wording.